Amatrol’s Discrete Wiring Application Station (89-DWS) adds to the Programmable Controller Troubleshooting Workstation (890-PECB) to provide a variety of discrete wiring applications. 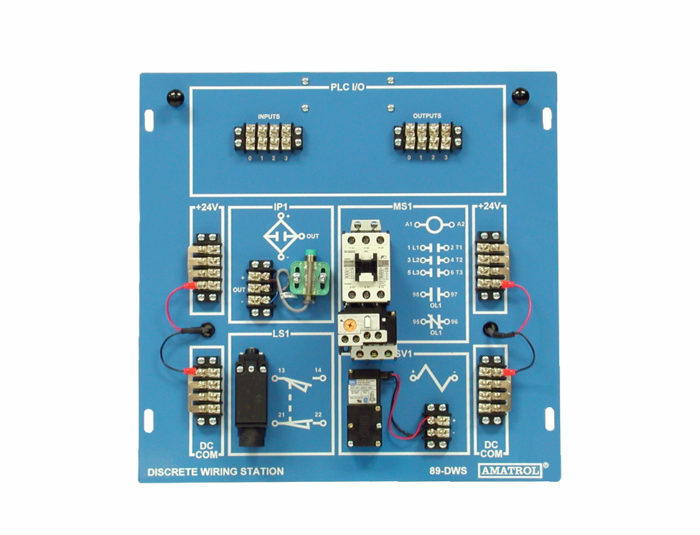 The Discrete Wiring Application Station includes a limit switch, an inductive sensor, two 24V terminal wiring blocks, two common terminal wiring blocks, an input terminal block, an output terminal block, a solenoid valve, and a motor starter. Components are mounted to a silkscreened application panel with a 24V power supply interface. The 89-DWS allows Amatrol’s Programmable Controller Troubleshooting Workstation to be used in conjunction with both Allen-Bradley (890-AB5500) or Siemens (890-S7315B / 890-S7312B) PLCs to teach PLC programming, troubleshooting, and discrete wiring applications in industrial, commercial, and residential sectors.